If you’re like me, you might be worried that the world is being taken over by monoids. Binary operators that are associative and respect unity are popping up everywhere. Even our beloved monads are being dismissively called “just” monoids in the category of endofunctors. Personally, I have nothing against associativity, but when it’s not there, it’s not there. Did you know, for instance, that addition is non-associative? Of course, I’m talking about floating-point addition. Taking averages is non-associative. Lie algebras are non-associative. At a recent FARM (Functional Art, Music, Modelling and Design) Workshop, Paul Hudak spoke of a non-associative way of tiling temporal media (the %\ — percent backslash — operator). In mathematics, there exists a simpler notion of magma, which is a structure with a binary operator with no additional conditions imposed on it. So monoid is really “just” a magma with some additional structure. Take that monoid! There was a recent interesting post about free magmas and their relation to binary trees, which shows that magmas might be relevant outside of geology. All this encouraged me to revisit some of the areas traditionally associated with monoids and give them another look-see. If nothing else, it’s an opportunity to have a little refresher in monoidal and enriched categories. Hopefully, this will also help in understanding Edward Kmett’s latest experiments with encoding category theory in Hask. Let’s start by slimming down the usual definition of a monoidal category: A magmatic category is a category 𝒱0 with a functor ⨁ : 𝒱0 ⨯ 𝒱0 → 𝒱0 from the cartesian product of 𝒱0 with itself to 𝒱0. This is our “attach” operator that works on objects and can be lifted to morphisms. That’s it! A monoidal category would also have the unit object I, the associator, the left unitor, the right unitor, and two coherence axioms. But if magma is all we need, we’re done. In what follows I’m not going to be interested in associativity until much later, but I will consider including the unit object I (a magma with a unit is called a unital magma). What defines the unit object are two natural (in X) isomorphisms: lX: I ⨁ X → X, and rX: X ⨁ I → X, called, respectively, the left and the right unitors. Still, because of no associativity, there are no coherence axioms one has to worry about in a monoidal category. Having a unit object allows us to define an interesting functor that maps any object X to the hom-set 𝒱0(I, X) — the set of morphisms from I to X (obviously, this is a set only if 𝒱0 is locally small). We’ll call this functor V, to make sure you pay attention to fonts, and not just letters. Why is it interesting? Because it’s as close as we can get, in category theory, to defining an element of an object. Remember: in category theory you don’t look inside objects — all you have at your disposal are morphisms between amorphous objects. So an element of a set can be defined as a morphism from the terminal set. Nothing stops us from extending this definition of an “element” to an arbitrary category that has a terminal object. But what does a terminal object have to do with a unit object in the monoidal (or unital-magmatic) category? In the archetypal monoidal category — the cartesian monoidal category — the terminal object is the unit. The binary operator is the product, defined by a universal construction. That’s why we can call a morphism f from the hom-set 𝒱0(I, X) an element of X. In this language, V maps X into a set of elements of X — the underlying set. The usual universal construction of an exponential object YX can be easily reproduced in a magmatic category. We just replace the cartesian product in that construction with the “attach” operator we have at our disposal. Notice that we are using the fact that ⨁ is a (bi-)functor, which means it can be applied to morphisms as well as objects. 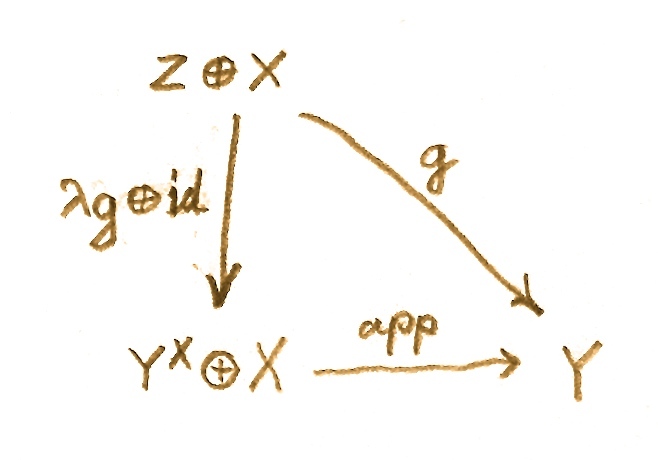 Here it’s applied to λg and id (the identity morphism on X). This equation is just the re-statement of the condition that for every g : Z ⨁ X→ Y there is a unique λg : Z→ YX, except that we now require this mapping to be natural in both Y and Z.
Here’s the interesting part: This definition can be viewed as generalized currying. Normal currying establishes the relationship between functions of two arguments and functions returning functions. A function of two arguments can be thought of as a function defined on a cartesian product of those arguments. Here, we are replacing the cartesian product with our magmatic operation, and the adjunction tells us that for every morphism g from Z ⨁ X to Y there is a morphism λg from Z to the exponential object YX. The currying intuition is that YX objectifies morphisms from X to Y; it objectifies the hom-set 𝒱0(X, Y) inside 𝒱0. In fact YX is often called the internal hom-set (in which case 𝒱0(X, Y) is called the external hom-set). tells us that elements of the (external) hom-set 𝒱0(X, Y) are in one-to-one correspondence with the “elements” of the exponential YX. This is not exactly the isomorphism of external and internal hom-sets, because of the intervening functor V, which might not even be faithful. However, this is exactly one of the conditions that define a closed category, hinting at the possibility that the adjunction defining the exponential object in a unital magmatic category might be enough to make it closed. This looks just like currying inside the internal hom-set, except for the functor V. So to curry from the external to the internal hom-set it’s enough to have a unital magmatic category, but to curry within the internal hom-set we need the full monoidal category. A (locally small) category consists of object and sets of morphisms, hom-sets, between every pair of objects. All we need to assume about morphisms is that they compose nicely and that there exist morphisms that act as units of composition. Think of it this way: Each hom-set is an object from the Set category. Composition is a mapping from a cartesian product of two such objects to a third object. But why restrict ourselves to Set to draw our hom-sets from? Why not pick an arbitrary category? The only question is: How should we define composition of morphisms? Morphisms are elements of hom-sets. In an arbitrary category we might not be able to define elements of objects. What we could do, however, is to pick a category that has all the products and define composition as a mapping (morphism) from a product of two objects to a third object. This is analogous to defining composition in terms of cartesian products of hom-sets, rather than defining it point-wise on individual morphisms. As before, since we don’t have to worry about associativity, we can omit the rest of the axioms. A functor maps objects to objects and morphisms to morphisms. The mapping of objects translates directly to enriched settings, but we don’t want to deal with morphisms individually. We don’t want to look inside hom objects. Fortunately, we can define the action of a functor on a hom-object as a whole. The mappings of hom-objects are just morphisms in 𝒱0. Notice that both categories must be enriched over the same 𝒱0 for TAB to be a morphism. αA: I → ℬ(T A, S A). The fact that the existence of the unit is necessary to define natural transformations in enriched categories is a little surprising. It also means that adjointness, which is defined through natural isomorphism between hom-objects, cannot be defined without a unit. On the surface, the enriched version of the Yoneda lemma looks deceptively simple. But there are some interesting nuances that should be mentioned. So let me recap what Yoneda is in the more traditional setting (see my blog post about it). It’s about functors from an arbitrary category to a much simpler category of sets — a category where we can actually look at elements, and where morphisms are familiar functions. In particular we are practically given for free those very convenient representable functors. These are the functors that map objects to hom-sets. You just fix one object, say K, in the category 𝒜, and for any other object X you get the set 𝒜(K, X) in Set. This mapping of X to 𝒜(K, X) is called a representable functor because, in a way, it represents the object X as a set. It is a functor because it’s also defined on morphisms. Indeed, take a morphism f: X → Y. Its image must be a function from 𝒜(K, X) to 𝒜(K, Y). So pick an h in 𝒜(K, X) and map it to the composition f∘h, which is indeed in 𝒜(K, Y). which, additionally, is natural in both K and F (naturality if F requires you to look at F as an object in the category of functors, where morphisms are natural transformations). So how do we go about generalizing Yoneda to an enriched category. We start with a representable functor, except that now 𝒜(K, X) is not a hom-set but a hom-object in 𝒱0. The mapping from the enriched category 𝒜 to 𝒱0 cannot be treated as an enriched functor, because enriched functors are only defined between categories enriched over the same base category, and 𝒱0 is not enriched. So the trick is to enrich 𝒱0 over itself. This defines composition of hom-objects for us. The mapping is induced by the adjunction that defines the exponential object, and in fact requires associativity, so we can relax and admit that we are now in a closed monoidal (rather than magmatic) category. Oh well! (with V on the right hand side the functor that defines “elements” of an object). So 𝒱 not only has the same objects as 𝒱0 but its hom-objects are lifted by the functor V from hom-sets of 𝒱0. That makes 𝒱 a perfect stand-in for 𝒱0 in the enriched realm. We are now free to define (enriched) functors that go from any category 𝒜 enriched over 𝒱0 to 𝒱. In particular, the mapping 𝒜(K, _): 𝒜 → 𝒱, which assigns the object 𝒜(K, X) to every X, defines a representable enriched functor. This way an object X in some exotic enriched category 𝒜 is represented by an object in a presumably better understood category 𝒱 which, being closed and monoidal, has more structure to play with. More precisely, there is a bijection (one-to-one mapping that is onto) between the set of natural transformations Nat(𝒜(K, _)) and the set 𝒱0(I, F K). Nat(𝒜(K, _)) ≅ 𝒱0(I, F K). Notice that the bijection here is between sets: a set of natural transformations and a set of morphisms. 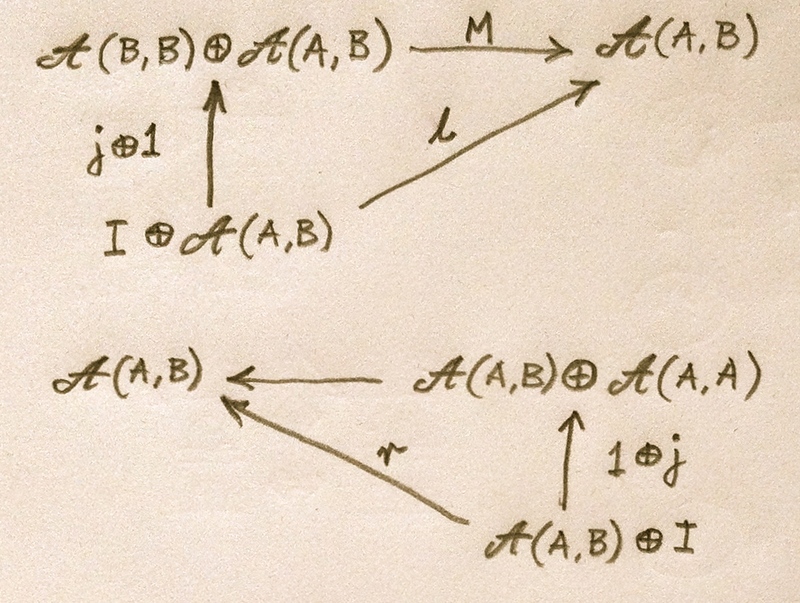 There is a stronger version of the Yoneda lemma, which established a bijection between objects rather than sets. But for that one needs to objectify natural transformations, something that can indeed be done using ends. But that’s a topic for a whole new post. My main motivation in this blog post was to try to figure out how far one can get with magmas before being forced to introduce a unit, and how far one can get with unital magmas before being forced to introduce associativity. These results are far from rigorous, since I might not have been aware of some hidden assumptions, and because the fact that some property is used in the proof of another property doesn’t mean that it is necessary. I’m grateful to Gershom Bazerman for stimulating discussions and helpful pointers. Cheers, I discovered more than your blog, I discovered a kindred spirit: I too combine both worlds of theoretical physics and programming. “in category theory you don’t look inside objects — all you have at your disposal are morphisms between amorphous objects.” Indeed. It may interest you that quantum mechanics has a very deep relationship with category theory and monoids: category theory completely determine the algebraic structure of QM and from this one obtains the standard formulation in terms of Hilbert spaces, nothing more, nothing less (http://arxiv.org/abs/1407.7610). Is there anything I can do about it ?